Four-goal third period ices Hingham in championship game. 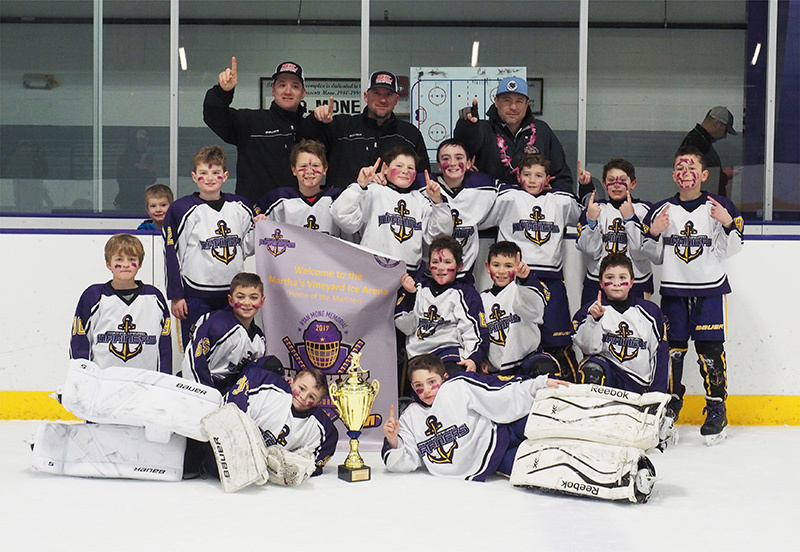 Fresh off a Wales Division title in the Southern New England Hockey Conference (SNEHC), the Martha’s Vineyard Mariners Squirts of the white-and-purple-uniformed variety skated to the annual Ryan Mone Memorial Tournament title with a 6-1 win over Hingham in the championship game, Sunday morning at the MV Ice Arena. 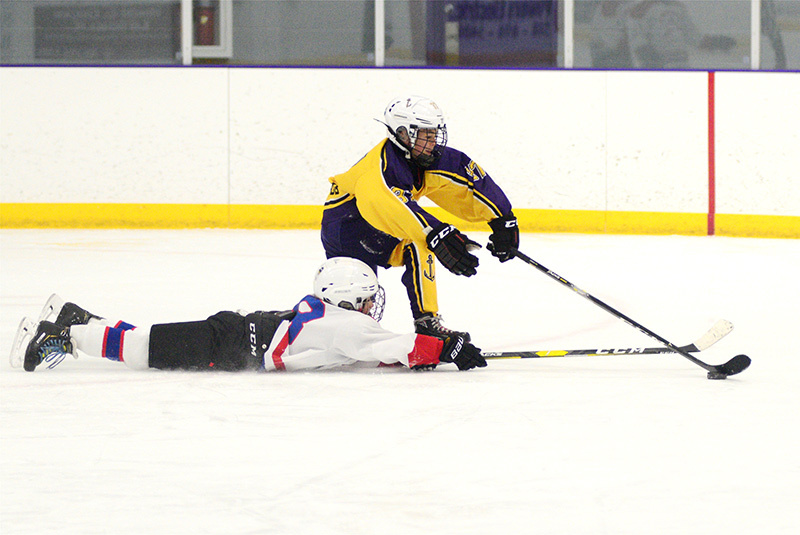 The final was a terrific contest for two periods, with the Vineyard skaters clinging to a 2-1 lead. Once the puck dropped for the third period, the hosts took over, scoring four goals in a 5:43 span to earn the championship trophy. 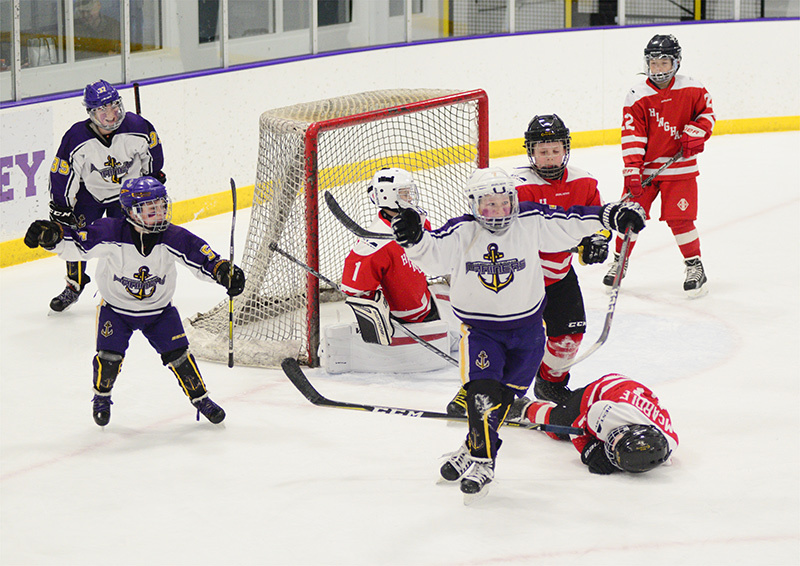 In the end, the Purple Mariners had too much speed and skill, and left Hingham chasing shadows when it mattered most. Macallan Moran opened the scoring 2:21 into the game by deflecting a floater from the blueline. Griffin Callahan made it 2-0, 55 seconds into the second period, with a nifty deke around the prone Hingham netminder. Aeneas Forrester and Max Metell picked up assists. Hingham scored on the power play with 1:18 left in the second period to cut the Vineyard lead in half heading to the intermission. Just 25 ticks into the final period, Ben Kokoszka converted a perfect feed from Donnie Gregory at the left post, lifting in a backhander for a 3-1 Vineyard lead. Two minutes later, Joseph Medeiros lit the lamp with a wrister from the right circle, and Gus Lambert potted a pair 1:17 apart, with assists to Medeiros and Gregory, to close out the win. 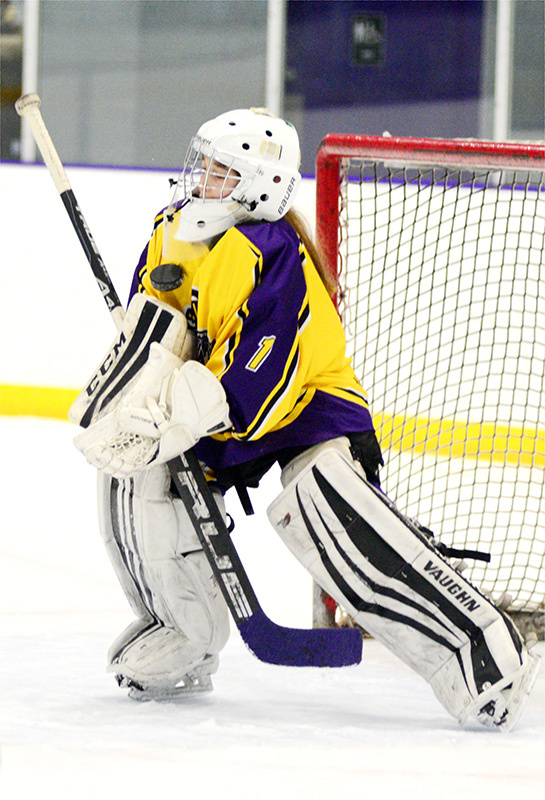 Aeneas Forrester and Russell Coogan shared the goaltending duties. 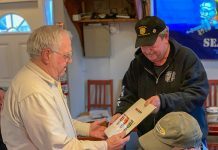 All told, the champs, coached by Donnie Gregory, William Coogan, and William Callahan, won all four games over the weekend and outscored their opponents 32-5. 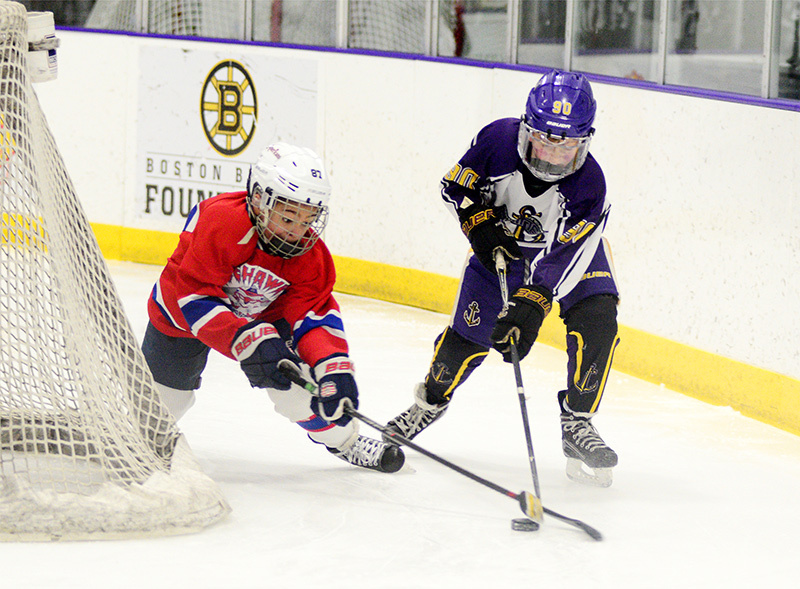 Prior to the championship game, the Mariners Gold team, which skates in the Norris Division of the SNEHC, defeated the North Shore Ice Hawks of Newbury, 5-1, in the consolation game to finish in third place. 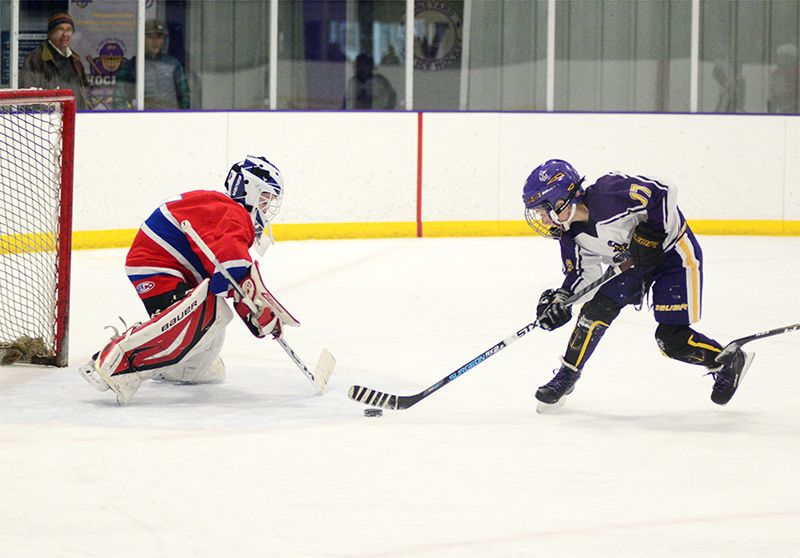 The gold-clad Mariners grounded the Hawks with three goals in the first period. 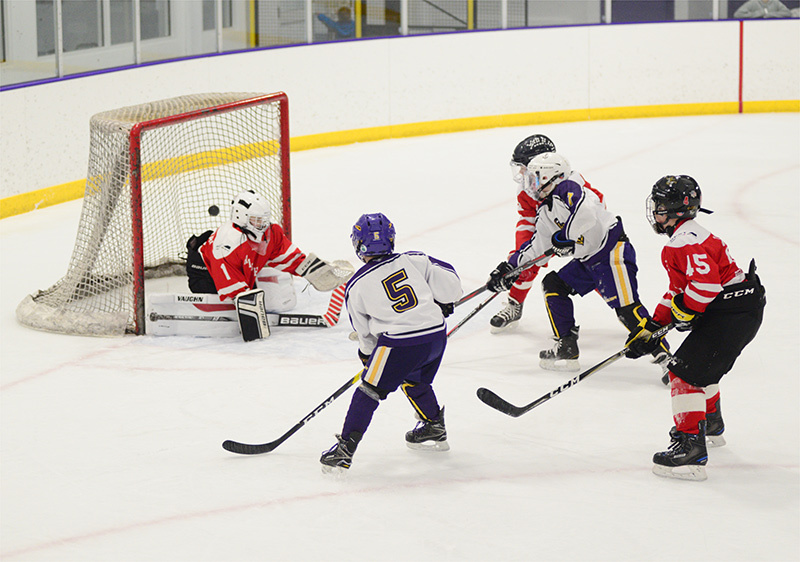 Ryan Heidt scored the first two, with the second assisted by Reese Malowski. Amos Sauer closed out the period by converting a penalty shot, whistling a wrister from the slot into the top left corner. Sauer lit the lamp again with 5:43 left in the game, and Angus Cummings put the puck through the goalie’s wickets with 3:14 remaining for the final tally. Bailen Darack was the winning netminder. The Gold team is coached by Nell Coogan, Chris Heidt, and Adam Wansciewicz. The tournament started on Friday evening with the Mariners Gold team skating past the Ice Hawks, 6-2. 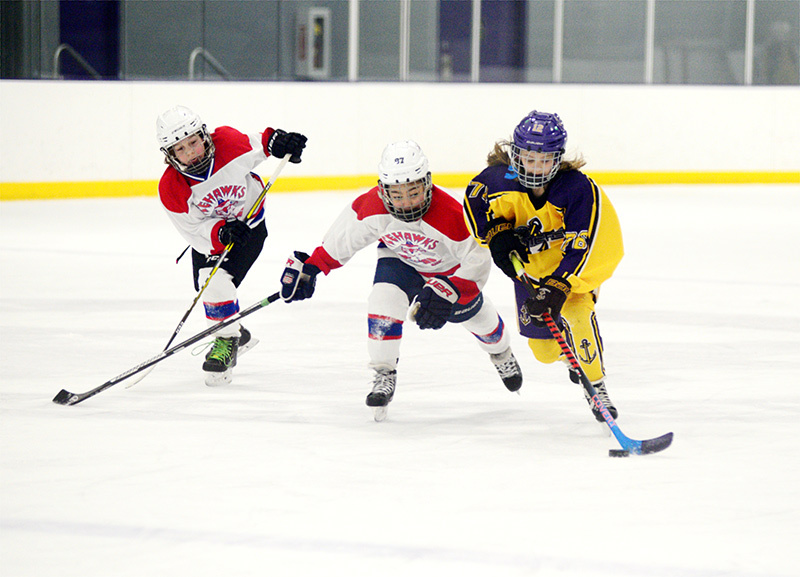 Ryan Heidt tallied twice, Reese Malowski had a goal and two assists, Killian Woods scored once and set up another, Abby Geary and Zoey Higgins had a goal apiece, and Ava Mikos earned two assists. 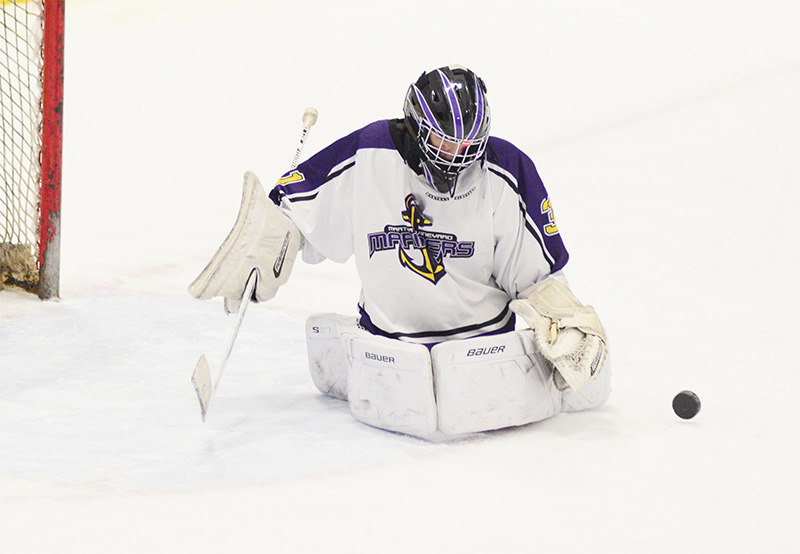 In Friday’s nightcap, Joseph Medeiros and Gus Lambert scored two goals each as the Mariners Purple squad downed Hingham, 9-2. Hingham drew first blood, but MV scored six goals in a 6:32 span of the first period to break the game open. Donnie Gregory notched a goal and two assists, Ben Kokoszka had a goal and an assist, and Griffin Callahan, Finlee Callen, and Max Metell scored a goal apiece. Silas Meader, Aeneas Forrester, and Macallan Moran each had an assist. 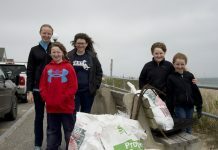 Saturday was the busiest day of the weekend, with each team playing twice. 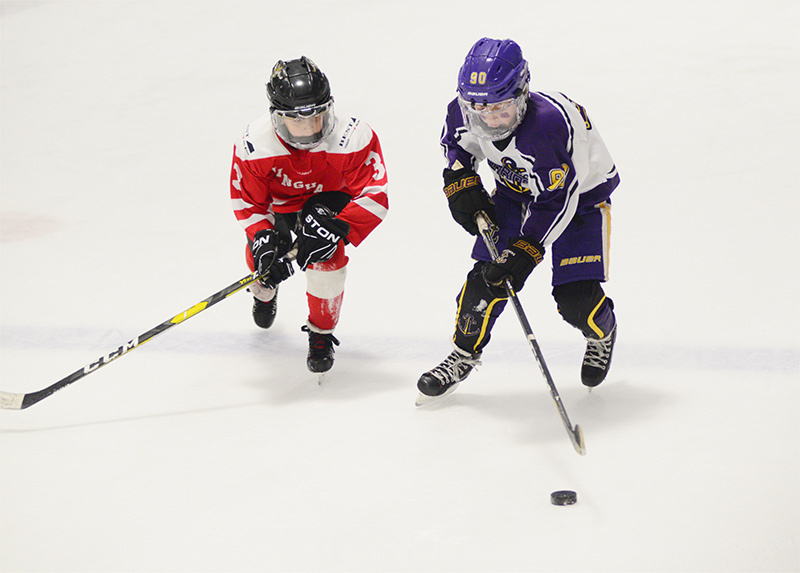 The Vineyard teams faced off against each other in the morning session, with Purple defeating Gold 7-0. 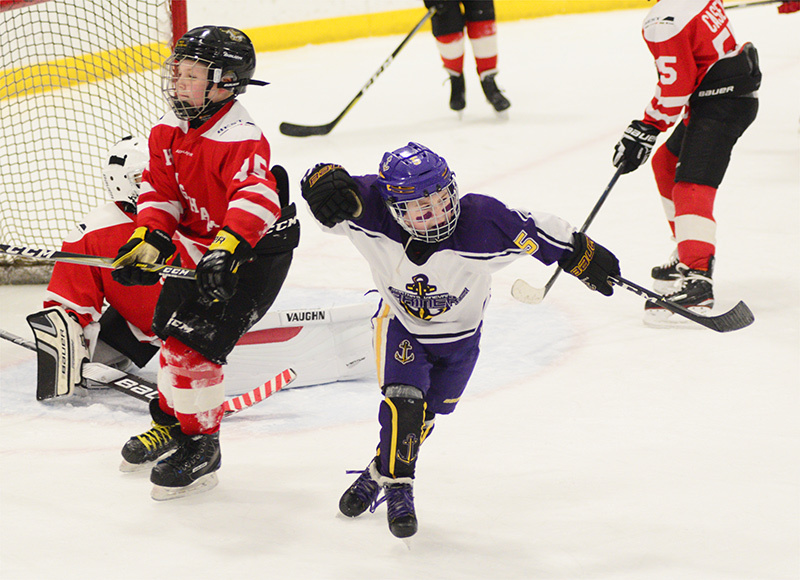 Joseph Medeiros and Finlee Callen each chalked up two goals and an assist, while Gus Lambert picked up four points with a goal and three assists. Griffin Callahan had a goal and an assist, Russell Coogan scored once, and Ben Kokoszka had an assist. 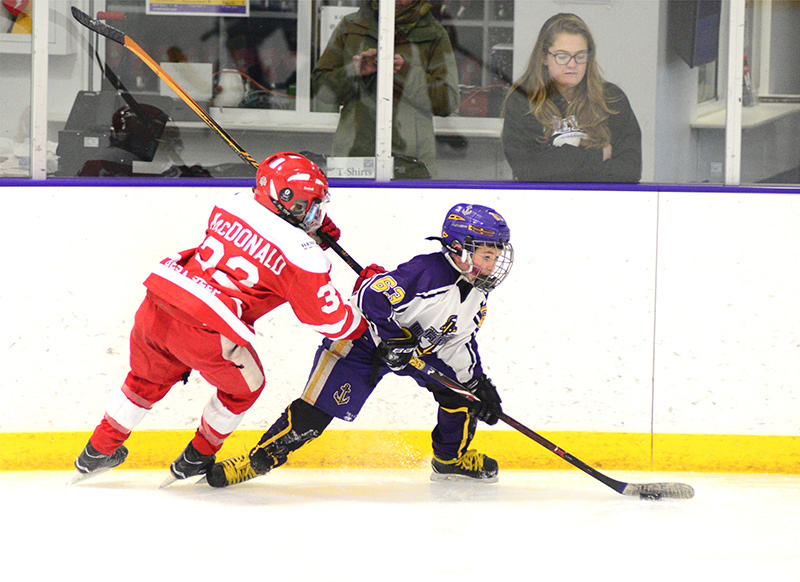 Saturday afternoon, Hingham jumped out to a 3-0 first-period lead and held off the Mariners Gold team for a 7-4 win. Reese Malowski, Killian Woods, Ava Mikos, and Abby Geary put the biscuit in the basket, with Rowan Huffam picking up an assist. 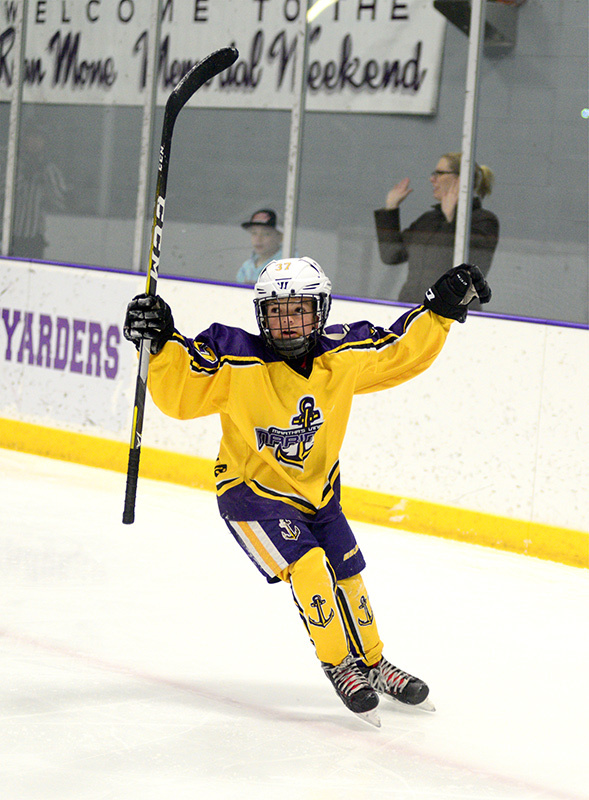 The Purple Mariners closed out the day with an emphatic 10-2 win over the Ice Hawks. Peter Williamson scored a hat trick and added an assist as MV broke open a 1-1 tie with eight unanswered goals. Ben Kokoszka (2 goals, 1 assist), Donnie Gregory (2G), Griffin Callahan and Macallen Moran (1G and 1A each), Jonathan Ruzzo (1G), and Gus Lambert and Finlee Callen (1A each) all made the scoresheet for the victors.